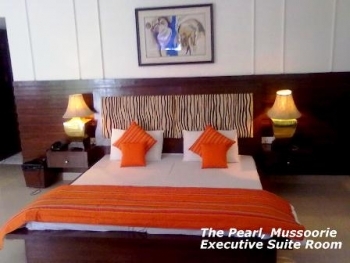 The Pearl A Royal Residency is a deluxe hotel is situated on the famous Mall Road of Mussoorie hill station. The hotel is surrounded by lush tropical forest offering enchanting views of the splendid Himalayan range and Dehradun valley. The Pearl Hotel is designed to cater Cosmopolitan clients with well trained staff dedicated to provide efficient service. The hotel is strategically located in close proximity of shopping arcades, famous gardens, and prime leisure spots of Mussoorie. Well furnished accommodation, delicious cuisine, impeccable services and scenic views, makes Hotel Pearl a perfect residing option to explore the Queen of Hills - Mussoorie. The Pearl Royal Residency hotel is situated on Mall Road of Mussoorie, opposite the Picture Palace. The hotel is situated just 500 metres away from the bus stand. The Pearl Hotel in Mussoorie offers accommodation in the room categories of Double Deluxe Valley View, Double Deluxe Front View, Family / Executive Suite valley View and Family / Executive Suite Front View to cater mood of discerning travellers. The hotel serves with total 34 well appointed and fully furnished rooms. Room amenities include Satellite TV, Direct Dialling, attached bathroom and round the clock personal attentive services. A Royal Pearl hotel in Mussoorie has the multi-cuisine restaurant offering a variety of delicious meals. The restaurant is opened to guests from 7am to 11pm, however if you want comfort and privacy, the meals can be served in your room. - Well appointed room for two. - Well appointed room for a Couple & a Child. - Specially prepared light meal course in the room. - Chocolates or Cookies in the room. 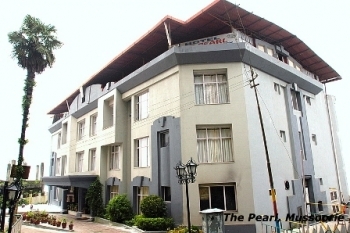 The Pearl Residency Hotel is situated 35kms from nearest railhead, Dehradun Railway Station. After reaching Mussoorie from Dehradun, drive to Picture Palace, Kulri. The Pearl - A Royal Residency is situated opposite to Picture Palace at Kalsia Estate.